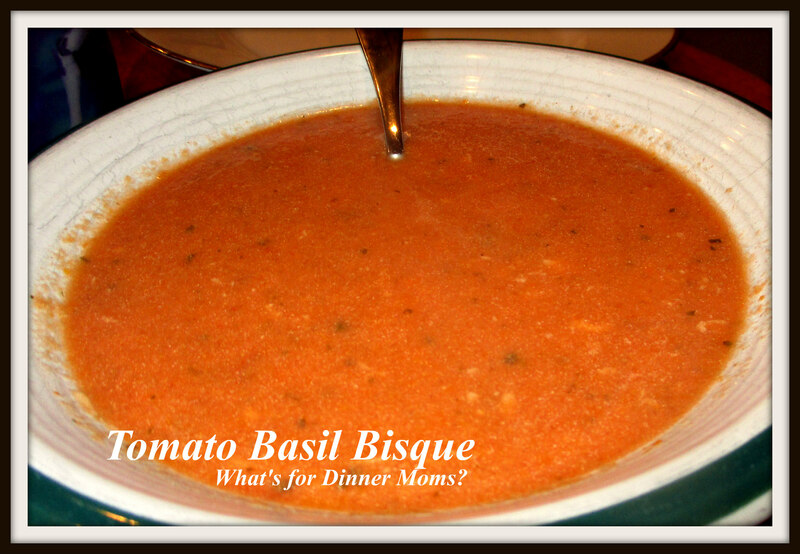 Slow Cooker Tomato Basil Bisque – What's for Dinner Moms? This past weekend was our one weekend home for the month. It means we try to cram everything we want to do at home into one weekend. We pounded chicken down, poached a few breasts for casseroles and cut others into tenders all for freezing. Then there is the house cleaning. The one billion and one Legos were cleaned up in the basement and loads of laundry were folded and put away. All beds were stripped and remade. Halloween decorations came down and Christmas decorations are ready to go up. In other words it is a typical weekend! Yes, we are one of those families that put up their Christmas decorations right after Halloween. I love Christmas lights and take quite a bit of time decorating the house and really want to enjoy it for a while. We usually do leave the tree bare until either Thanksgiving evening or the day after when we decorate it but everything else will already be up by then. I also want the house cleaned before the decorations go up so the kids are washing doors and base boards throughout the house. I do have to go pick up some paint for the spot where my son hit the wall with a chair. The hole is patched but it needs to be painted. The weather is starting to turn colder so I feel like this is the perfect time for Christmas decorations. With the first signs of the colder weather I also have an overwhelming desire to make soups. So, of course my son’s first question about this meal was, “What is the difference between soup and bisque?” His sister gave a great answer, “All bisque are soups but not all soups are bisque.” She is correct. Bisque is creamy and smooth with no chunks. If there are chunks it is a chowder, if it is cream based. Therefore Manhattan Clam Chowder is really not a chowder but a soup. My children like to know exactly what they are eating. This was delicious. But, I also found out two of my family do not care for soup, especially bisque, as a meal. They both loved the flavor of the bisque but both want something to chew. So, one put crackers in it and another just ate it but didn’t want more. The smell of the house during the day when it was cooking was amazing. The basil sent filled the entire house. I served this with sandwiches on the side. A really good grilled cheese would be great with this dish. Place tomatoes – canned and fresh, carrots, celery, onions, garlic, stock, and basil into the slow cooker and stir. Cover and cook on low 6-8 hours or high 3-4 hours. Vegetables should be soft when mixture is completely cooked. Using an immersion blender or removing to a blender, blend mixture until smooth. Return mixture back to slow cooker (if removed) and add half-and-half. Stir well and allow to warm though for about 10-15 minutes. Do not boil! Serve hot with a side of Parmesan for topping if desired. I love my slow cooker! I use it at least twice a week. There are hundreds of entrees, sides and desserts you can make in it. This looks great. We are now on a gluten-free diet in my house, hubby has been diagnosed with intolerance. So soups like this would go great with a nice salad. Just no more bread bowls for now. I need to find a good gluten free bread recipe. Gluten free breads are tough. I have a mostly gluten-free son (also intolerance) for the past 7 years. I usually do his food together with ours until I add flour or pasta then I do a 2/3 split. We get 2/3 he gets 1/3. Other than pasta and bread most recipes you can now substitute GF flour 1 for 1. One of the reasons I keep a pot of basil all the times. Love it! I love holiday decorations and put up a little string of blue lights a month ago!! Well ok look it’s not Christmas but fall like! That is what I say!! I love this soup very nice! Pingback: Slow Cooker Creamy Tomato Basil Soup – What's for Dinner Moms?